Since I'm always on the lookout for new things to eat while trying to concentrate on whichever pointless victim is having their insides torn out on the screen in front of me, I happened across these yesterday. 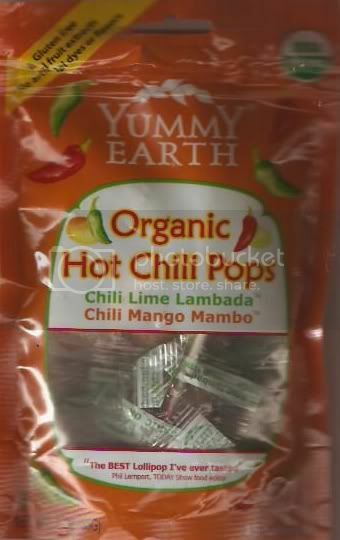 Yummy Earth Organic Hot Chili Pops, in spite of the nauseatingly childish name, are very good although certainly not "The BEST Lollipop I've ever tasted" unlike the quotation from someone I've never heard of on the bag. They come in two flavours, Chili Lime Lambada and Chili Mango Mambo, but you won't be able to tell much difference after sucking on two or three of them as, if you are truly lame, your mouth may be on fire. They do really taste of lime and mango though. Since I cannot abide people who don't like hot food, and detest children even more so, you can only begin to imagine the gleefulness which will fill my very soul when I put some of these bad boys out for unsuspecting "Trick or Treaters".